Are you making the most of the scholarships on offer? Receiving a scholarship has historically been regarded as a sign of academic achievement and success. Often people awarded scholarships were the cream of the crop, top 5% candidates. However these days there are so many more scholarships available and getting your hands on one is more of a science than an art. In fact, scholarships have become so accessible that one man has made a living out of showing people how to win them - Ben Kaplan graduated in1999 with an economics degree from Harvard but no student debt. Kaplan is a bestselling author who went on to build a successful scholarship coaching website and describes paying for college as ‘a game’. Read his full interview for Business Week back in 2005. Merit-based: Awarded to high achievers by private organizations or directly from your intended college. Needs-based: Awarded based on an individual's financial situation, often using a formula to calculate if the recipient qualifies as financially needy. Student-specific: Awarded to applicants on the basis of race, gender, religion, family, medical history, or many other student-specific factors e.g. Minority scholarships. Career-specific: Awarded to applicants planning to pursue a very specific field of study or a career in a high-demand area (differs geographically). 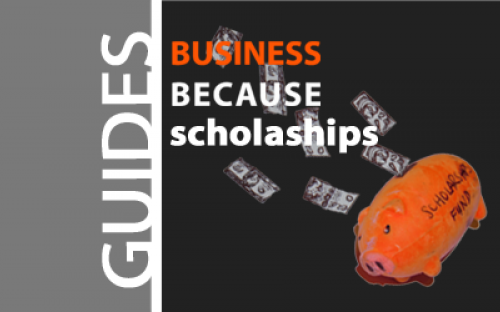 Our top tips to get a scholarship? We’ll assume at this stage that you’ve already short-listeded some b-schools to apply to, before you start scholarship hunting. Start NOW. The earlier the better, obviously, but even if you’re already enrolled there are still scholarships you can apply for such as internship scholarships. Be creative. Consider the four categories of scholarships listed above and try to think about which category you might fit into – be creative about what you can apply for and why. A good starting point for your research are the websites of your chosen universities - look at the scholarships offered by the school and any partner organizations or funds. There are also thousands of funding opportunities from corporations, foundations, associations and industry groups so don’t restrict your research to just the university offerings. You may want to try out the scholarship search engine Fastweb.com and Scholarshipportal.eu. You can find a comprehensive global list of MBA scholarships (both domestic and international) at mbascholarships101 and at The Association of MBAs Scholarship's page. For encouragement, you can read scholarship success stories here: Scholarships.com. It's a numbers game. Try to find at least 10 scholarship funds to apply to. It’s a numbers game so the more you apply to the more you’re likely to be offered. Also, once you’ve written one fund application you can replicate the basic elements for all of your applications, don’t re-invent the wheel each time. These scholarships won’t come to you – most people who’ve been awarded one will have worked pretty hard to get it! Bear in mind the amount of the scholarship award and the number of people applying for it when you select the best one for you – you should be able to find out some basic statistics about your scholarship online. Ask your network for help. Find friends or family who’ve been awarded a similar scholarship and ask them about their applications – what did they write, who did they apply to? Or even better try and track down someone on the committee of a scholarship fund – your network probably reaches someone somewhere! Create a calendar. Arrange the application deadlines in a calendar so that you can manage multiple scholarship applications at one time without missing any of the hand in dates. Knuckling down. Start writing your applications. There are heaps of websites, blogs, videos and books explaining how to write killer applications - so we won’t repeat here…however one tip gets mentioned time and again: attention to detail. Just like your CV the application will represent YOU on paper… the reviewer will sift thousands of applications – make it concise and easy to read, compelling, to the point and, of course, make sure the spelling and grammar is perfect. Start by trying to decipher the judging criteria and jot down some bullets. When you’re done go back and check that you’ve not drifted away from those criteria. "I applied and received one of the Class of 2011 AGSM MBA Community Spirit Scholarships. The application was well explained and straightforward with the process taking around 2 hours to complete. I also found this to be a useful exercise as the scholarship questions made me think deeply about what I had actually contributed to the community. As well as being financially rewarding the scholarship was also a reflection that an external body acknowledged these achievements." AGSM MBA Programs offer a number of scholarships to post grad applicants for a partial fee waiver from AUD $5,000 to $25,000. To view a full list of AGSM scholarships and more details visit the AGSM MBA Scholarships page. Refer here for a full list of RSM Scholarships and Grants. Donations by Warwick Business School's "Friends of WBS" have financed two awards (£2,500 and £10,200) for MBA applicants in 2010 who suffer with long-term disabilities. The larger bursary is unique as it is not necessary for the applicant themselves to have a disability, as the bursary will also be available to those who have a dependent child or partner with a long-term disability. Read the full story here. This is an example of a 'student-specific' scholarship. Cass Business School has just launched the Haberman Campaign to raise £1 million over the next 2 years to go towards creating funds for “a strong and competitive scholarships program for undergraduate and graduate students from around the world” in Actuarial Management courses (fully accredited by the Actuarial Profession). This is an example of a 'career-specific' scholarship. At Harvard Business School nearly 50% of the class receives an average of approximately $23,000 per year in needs-based HBS Fellowships. QS are offering US$1,200,000 in scholarship funding in 2012 for selected applicants from around the world who attend the QS World MBA Tour or QS World Grad School Tour and who complete the QS survey. As well as regular post-grad scholarships The University of Queensland are offering a special ‘Internship scholarship’ for new international students from Latin America accepted into a Masters degree in Business, Economics, Law and Tourism - another example of a student-specific award – international students should look out for these! Many chambers of commerce offer (usually small) grants to students in the community, especially those planning careers in business and public service. Business Schools also have funds specially allocated to students from developing and emerging countries. ESADE Business School runs the Unique Perspectives Diversity Scholarship while INSEAD run the Nelson Mandela Scholarship. HEC Paris also has a special fund for MBAs from emerging countries. You can use the search engine Scholars4dev.com to search for scholarships aimed at students from developing countries. Women's-only scholarships are on the rise. Top Business schools such as ESMT Berlin, IMD Lausanne, London Business School and HEC Paris have signficant funds specifically for women MBAs. The Forté Foundation Fellowships intends to increase the number of women applying to and enrolling in MBA programs now has over 39 participating schools in North America and Europe including IE Business School Spain. IE Business School in Spain three scholarships of up to 30% each for IE’s International MBA or any Executive MBA at IE. IE´s Growth Scholarships for Eastern European Nationals covers up to 50% of the tuition fees for all IE programs. The Leadership Scholarships for Asian Nationals is aimed to support excellent candidates from Asia. Up to five awards worth up to 50% of tuition fees are given annually for Master programs at IE or the DBA program. The Scholarships for BRIC Nationals provide financial aid of up to 30% of tuition fees for an IE’s Master program. IE´s Diversity in Management scholarships cover up to 50% of tuition fees and are awarded to students after and evaluation on their financial position and the IE Business School and The Organization of American States (OAS) support outstanding individuals of the Americas by offering 40% tuition scholarships for IE´s Master programs. IE Business School has also launched a scholarship with the UK Trade and Investment (UKTI) which allows UK students to study a master program that includes an internship in the field of international trade at UKTI’s Madrid office. Chinese University Hong Kong also updated its scholarship scheme this year. All full-time students admitted to its MBA Programs are automatically considered for an entrance scholarship. They have also pledged to make a double-digit percentage improvement in scholarship offerings. Aston Business School Birmingham released its new round of funding for its Executive MBA programme. There are 25 scholarships worth £5000 for each individual. Some summary information about available scholarships from top business schools can now be found on the right hand side of the school pages listed here. In some cases it is also worthwhile to investigate the country's policies towards attracting International students. For some countries like Australia which is a major International study destination, the government offers a number of scholarships for citizens of partner countries. So for Australia there are a number of scholarships offered in various categories by the Australian Government. Information about these is available on http://www.ausaid.gov.au/. In some cases these scholarships maybe awarded to pursue courses in particular subjects whereas in other cases it maybe just be awarded to the best candidate from a particular country to pursue any course of their choice. Excellent article otherwise and should surely be helpful to MBA aspirants looking for financial support to further their careers. definitely makes mba more possible... sometimes the course fees are huge! Each year, up to ten Philip Law scholarships are available to research students at ecch member institutions to develop teaching cases based on original field research carried out during their studies. The scholarships aim to stimulate new case authors and strengthen the role of original research in student management learning. Each scholarship is worth EUR1,525 and the student attends an ecch case writing workshop at no charge. The scholarships will be of interest to current or recent research students. Thanks for the article Sian. I would say that by far the best source of scholarships are the school's websites themselves. Some will be more explicit than others. Many schools play a game of "don't tell until the applicant asks", particularly if not a top 5 school. Others, like my own, are very explicit about what is on offer and available, and add new scholarships all the time. Have looked at fastweb.com (only for US schools), and mbascholarships101.com (found some old info about my own school and don't know how it got there). Guide To GMAT Prep: Ten Tips To Ace The Test!